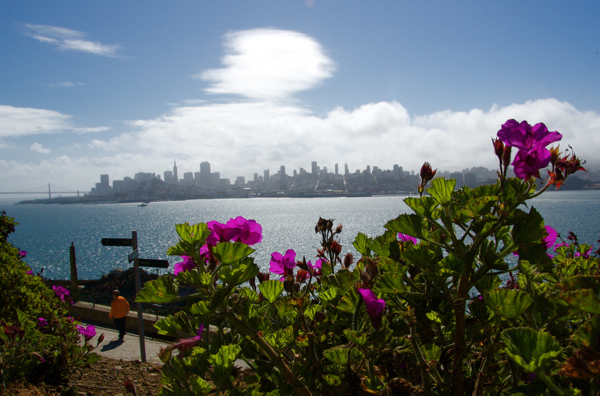 The typical view of Alcatraz Island. 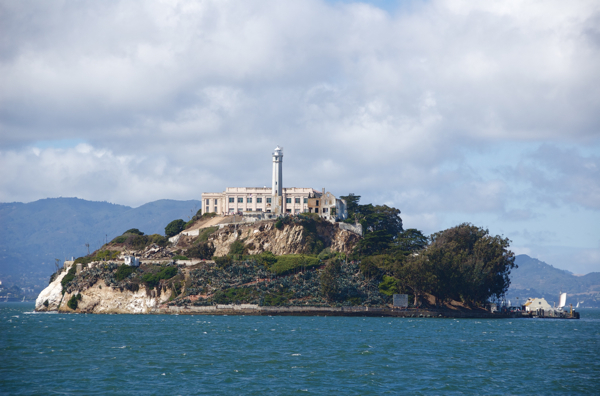 My adventure in tourism continued with an early visit to Alcatraz Island in the heart of San Francisco Bay and with a bit of skepticism that San Francisco may be overstating the importance of its attractions, preying on gullible tourists. Alcatraz is billed as the most infamous prison in U.S. history. Tourists spend $26 for a quick ferry ride to the island, where the admission is "free." I'm guessing that if you find your own way to the island - say, by swimming - it would really be free. You know you're doing a touristy thing when the workers at an attraction take your photo in front of a giant photo of the attraction, just in hopes that you'll be so thrilled that you'll buy that photo of a photo when your visit is through. Why not just snap a shot with your own digital camera with the real said attraction - Alcatraz - in the background? When we arrived on The Rock, my friend described it as a "creepy" place. I wasn't picking up that vibe; I just thought it was cold and windy. 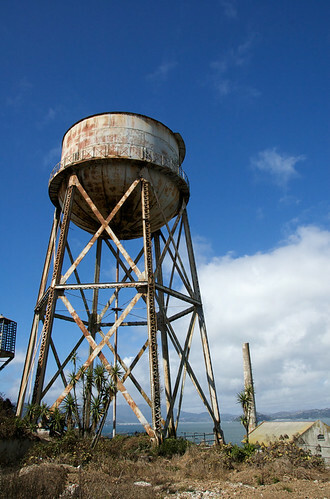 But in some cases such as with the water tower to the left, the island had a stark beauty. 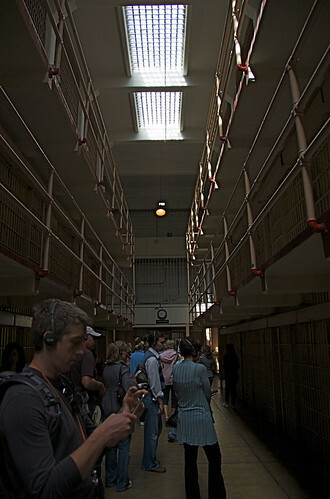 Included in the free $26 admission is an audio tour of the main prison house, which includes your very own experience of confinement in the same dank cells that housed such greats as Chicagoan Al Capone. The views of San Francisco from Alcatraz are breathtaking. I wondered why they used such a prime piece of real estate for a prison. (I suppose it's because it was previously a strategically placed fort). If the island were developed in modern-day Florida, there would be condos, a few retention ponds, a golf course for the adults and a theme park with a giant rodent to entertain the kids. The view was the greatest aspect of the prison visit. The audio tour was educational. I learned that the food there wasn't that bad. And I heard about the escape from the prison made by career criminal Frank Morris and the bank-robbing brothers John and Clarence Anglin. But that was 45 years ago, and seeing where they had crawled to the ceiling and gazing at the mock-ups of the dummies they used to trick the prison guards were causes to yawn. 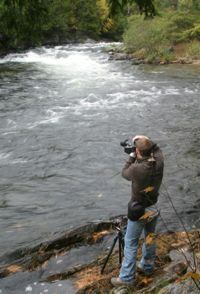 I wanted off The Rock. So after the 10-minute ride back to the mainland, we were touring the town again. 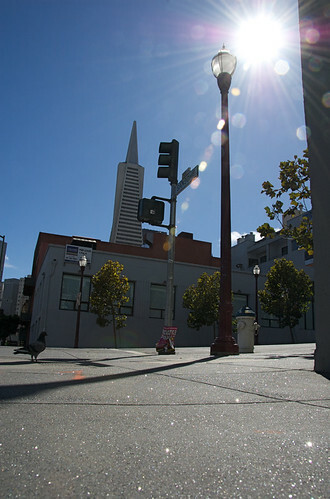 We saw the Business District and the Transamerica Building, left, a pyramidal skyscraper that sticks out as one of the most noticeable of San Francisco manmarks. We saw San Francisco's famous Chinatown, one of the largest in the nation, and we were quite unsatisfied. But I had my first dim sum experience, which I'll tell you about later. One of our final tourism events on Day 2 was a visit to the "crookedest street in the world." My friend and I remarked how San Francisco bragged about having the first, the only, the best, the biggest of all sorts of things. Alcatraz was the most infamous prison. A restaurant in the North Beach neighborhood was supposedly the oldest Italian joint in America. I would think New York would call San Fran out on that one. Another eatery, Forbes Island, claimed it was the only floating island restaurant in the world. Truth is, it's a man-made nautical achievement and isn't really an island at all. And I seem to remember eating at Dimillo's Floating Restaurant in downtown Portland, Maine, and being tossed gently up and down as the waves of the Atlantic came ashore. After realizing that the claim to fame of Lombard Street's extremely steep portion was probably just a lie, we began to debate the grammatical accuracy of the "crookedest street in the world." "Shouldn't it be 'most crooked street in the word?'" my friend, who's a reporter for The Associated Press in New York, said. As a copy editor, I made the ruling that it's technically correct. San Franciscans may get a bit too giddy about the gravity of their attractions, but at least they know their superlatives. The main corridor through three stories of cells at the Alcatraz prison is called Broadway. Original. 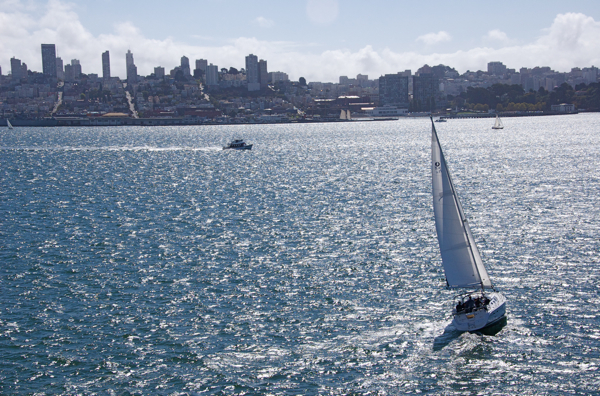 We visited the island on a Saturday, so there were plenty of rich people - of which there are many in San Francisco - sailing their yachts throughout the bay. The island is a surprisingly barren place, but it has pockets of beauty, such as this wild rosebush. 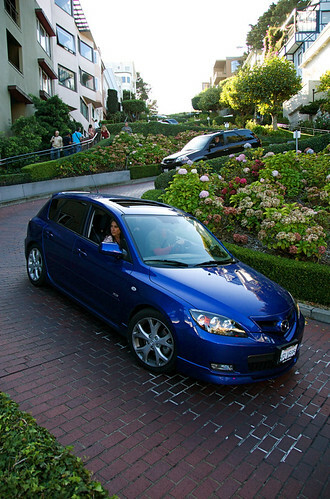 Cars lined for blocks to enter this part of Lombard Street, know as the "crookedest street in the world." Our Segway tour guide on Day 1 said the decline of this street is so great (27 percent) that engineers had to create such crookedness to make it safer. I say city planners just thought it would be a good way to get more tourists to visit San Francisco. I just pity the people who live on this block, forever relegated to being part of a yearlong tourist attraction.